Exploring the world with travel writer and editor Lori Knowles, one beach, ski run, and golf course at a time. I guess a Tuesday at the start of November is as good a time as any to start planning our 2014/15 ski season–yours and mine. In truth, as someone in the ski biz, it’s been on my mind since July… or earlier. But I’ve waited ’til now to get you revved up, otherwise your engine might burn out. I hope to tell you the few tidbits I get now and then on new stuff in the European and North American ski markets: new ski lifts, new runs, glades you can’t miss, or an apres-ski experience neither of us can pass up. Let’s see how it evolves. Hopefully the info will help you plan our next ski trips. The Village at Sun Peaks, BC. Photo by Adam Stein, courtesy of Sun Peaks. 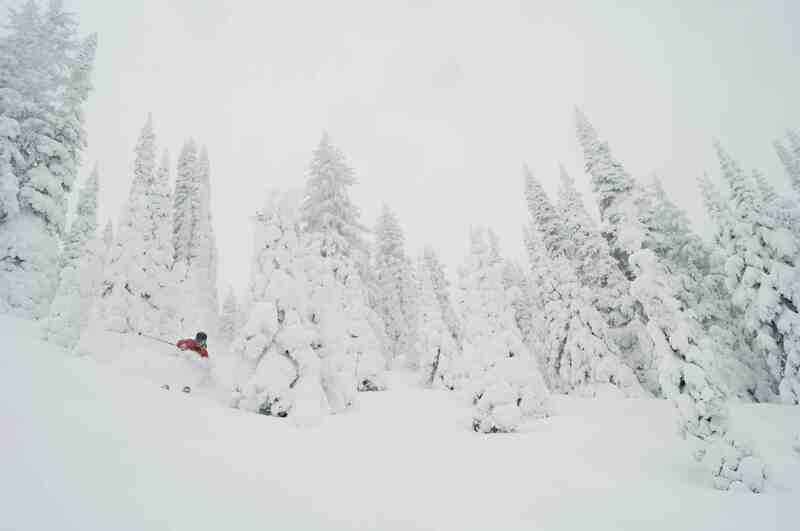 Sun Peaks is in idyllic ski spot in near the Canadian city of Kamloops. Its village is auto-free, its runs flow along a consistent and excellent fallline, and its trees are spacious and not too steep, which gives any ski area an A in my playbook. Tree skiing at Sun Peaks. Photo by Adam Stein, courtesy of Sun Peaks Resort. All this you can learn by visiting its website. 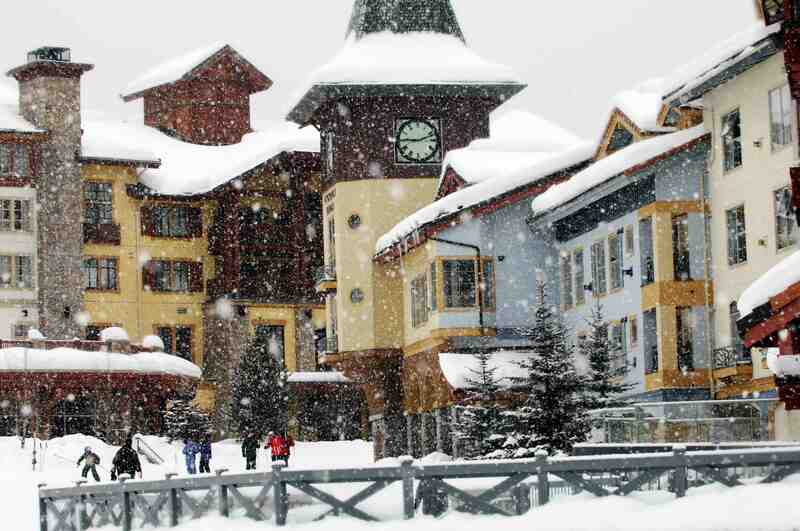 My news is this: For 2015, Sun Peaks has expanded to a point at which it’s now Canada’s second largest ski area. That’s pretty big — Canada’s largest is Whistler. This season Sun Peaks has grown to more than 4,200 acres of in-bound ski terrain with the addition of two new areas: West Morrisey and Gil’s. A panoramic shot of Sun Peaks taken from Mt Morrisey. Photo by Adam Stein courtesy of Sun Peaks Resort. In short, this expansion just might move Sun Peaks onto your short list of top spots in Canada to visit. I hope so. As I said, the resort is idyllic. 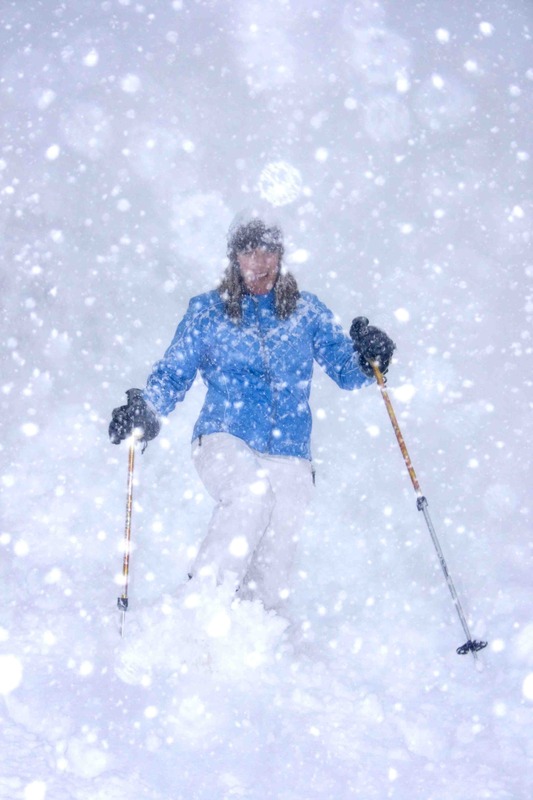 Lori Knowles is a ski and travel writer and editor based in Toronto, Canada. She is the editor of SNOW Magazine. See past work at LoriKnowles.com or follow Lori on Twitter @LoriExploring. 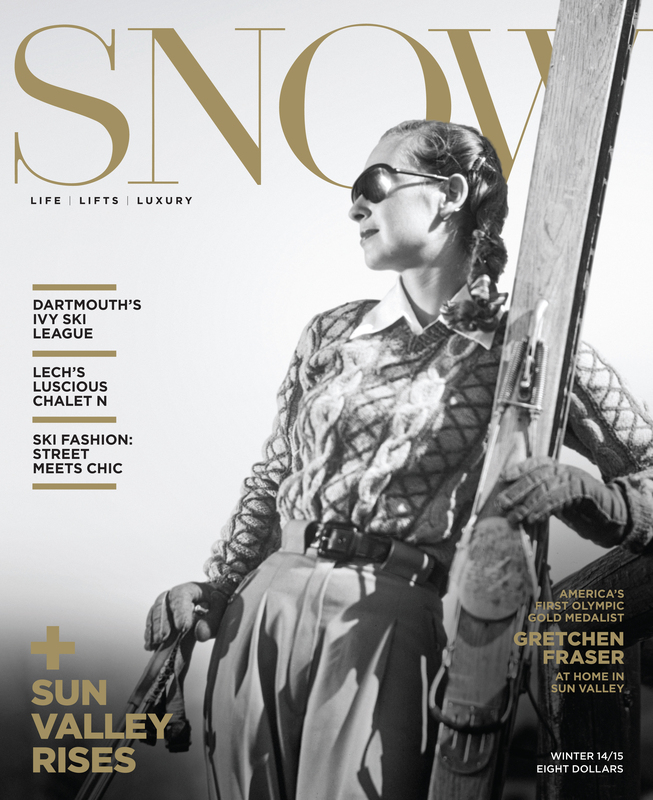 This week marks the launch of the Winter 2014/15 edition of SNOW Magazine, a sure sign winter is coming. isn’t she a beauty? The magazine is on stands now, as well as inside the rooms of the world’s best alpine hotels, in Air Canada lounges, and available for download on Zinio. See www.TheSnowMag.com and @SNOWmagazine for more information. Once you’ve got it, curl up in front of a warm fire, pour a glass of wine, and enjoy your read. Lech, Park City, the Okanagan, Sun Valley, Courchevel, Aspen… Reading these pages is the next best thing to skiing in one of these fabulous places. 1) I love to surf. 2) I’m terrible at surfing. I’m a 40-plus woman on a girlfriend-getaway in Tofino, British Columbia… capital of Canada’s cold-water surfing culture. Capital, I should say, of Canada’s female cold-water surfing culture–I’m told there are more women than men surfing Tofino waves. Tofino is home of Surf Sister, an all-female surfing school that offers all-women (and co-ed) surfing camps. You can learn in an hour, a day, a week… whatever. Surf Sister’s founder, Krissy Montgomery, has a band of pros under her wing who break down “the break,” making learning to surf Tofino waves really, really simple. Simple, that is, in theory… not necessarily in practice. Today I learned ‘popping up’ and ‘paddling out’ and ‘reading’ the waves are all more exhausting than simple. Exhausting! After my 14th wave, just as I figured out where to place my feet and hold my hands and bend my knees… my body turned to jello. Simply walking out into the surf became a trial. Stay tuned… humiliating surf photos to come! 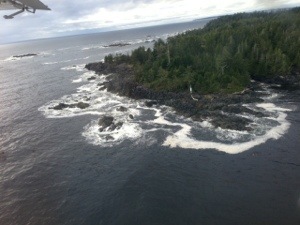 1) Consider a helicopter ride along this wild wet coast courtesy of Atleo Air. Jason Bertin’s new Tofino service offers sightseeing trips to glaciers, private islands, remote coastal locations…. head’s up, guys: it’s a good way to propose! Astounding and terrific. 2) Tofino’s Wildside Grill cooks the best BC salmon and spotted prawn I’ve ever tasted. Wildside’s Jeff Mikus is a commercial fisherman bringing BC’s sea delicacies straight to your picnic table. Chef Jesse Blake certainly knows how to BBQ them. 3) Order take-out (or hire a personal chef) from Tofino’s RedCan Gourmet. Chef Tim May makes a mean granola bar, brownie… and braises lamb to absolute perfection. So read my Saturday morning itinerary. Uh Oh. 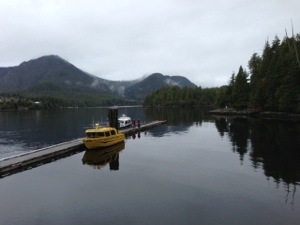 My first Girlfriend Getaway to Tofino, British Columbia, was starting with a boat ride in the Pacific Ocean. Should I mention I’m prone to sea sickness? Nah… I’ll be fine. And this will be a wild, warming experience. Marla drove that boat in the Pacific Ocean like Danica Patrick drives her race car: with verve. Never mind that within moments my face was as sallow as the sea kelp. Never mind through the entire two-hour coastal tour I was willing myself — forcing myself — to keep my breakfast where it belonged: in my tummy. The journey to the hot springs was still incroyable. We saw a whale! A great big tubular grey whale rolling in the waves, feeding on the shell fish delicacies hidden in the mud and sand near the Pacific’s cold shore. We saw sea lions basking in the spray of the waves; they lay lazily on the rocks of the mini islands that dot the coast of Vancouver Island. Until we came to the hot springs. Oh, the hot springs. What a sea treasure these springs are, hidden deep in Northern Clayoquot Sound. 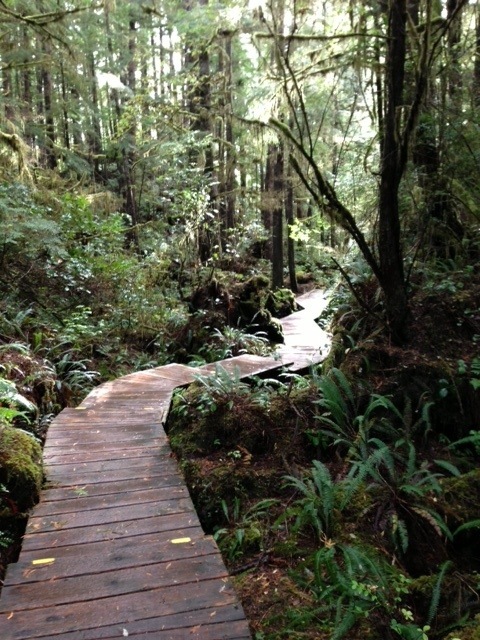 From a remote dock in Maquinna Provinical Park, the hot springs are a 30-minute walk along a wooden boardwalk (see top photo). The walk (loads of stairs included) delivers you to a narrow, rock-infested canyon full of steaming water… Off come the clothes. You stumble your way down into that warm, warm, soothing spring. Position yourself just so and you can see the sea’s waves below you rolling and crashing. More heaven. Sorry folks, I don’t have a photo of this natural Canadian wonder: the steam and the rocks were too risky for my camera. You’ll just have to go yourself and witness what my fuss is about. Next came my flight out. Tofino Air came to fly us back to Tofino. Holy Mackerel… see photo above. The west coast of Vancouver Island from the air is, is… I can’t find the word. Holy Mackerel. Our day ended with the Spotted Bear. British Columbia Ferry Services Inc. or BC Ferries, is known for showcasing BC’s spectacular scenery and proud maritime history. Celebrating its 50th anniversary in 2010, BC Ferries began in 1960 with two vessels and two terminals, and the operation has grown into one of the largest, most sophisticated ferry transportation systems in the world. With a fleet of 36 vessels that make up to 47 ports of call along the diverse communities on the BC coast, BC Ferries is the primary provider of ferry service in the province and plays a vital role in the region’s economy. From maintaining a constant flow of goods and services, to linking families and friends, to attracting tourists to many unique and beautiful destinations, BC Ferries is a key player in the development of life on BC’s coast. The Vancouver Island region is a large, sparsely populated area, encompassing Vancouver Island, the Gulf Islands, as well as a portion of the mainland. Condé Nast Traveler magazine’s 2009 Readers’ Choice Awards ranked Vancouver Island second in the “Top Islands of North America” category. It has one of the world’s most diverse ecosystems: Rainforests, marshes, meadows, beaches, mountains, oceans, rivers and lakes create habitats for multitudes of wildlife species. In fact, the region is one of the world’s premier locations for whale watching, birding, as well as salmon and trout fishing. Follow the signs off the Ferry directing you to Parksville. Welcome to Parksville and Qualicum Beach! The central Vancouver Island tourism region of Qualicum Beach & Parksville BC is Canada’s best family friendly beach destination according to Better Homes and Gardens. The Globe & Mail called these Vancouver Island tourism towns “Canada’s Riviera”. Local islanders often call this charming collection of communities “Oceanside”. In addition to the Parksville and Qualicum Beach region’s wealth of ocean beaches, sunseekers and swimmers have a number of rivers and lakes to check out and enjoy. These spots will often have a few more shade options and cooler water for those really hot days. Not surprisingly, given their central role in life here, Oceanside’s beaches host dozens of events and festivals annually. Combined with beachside restaurants, ice-cream stands, waterfront promenades and bookable rooms with a view, they’re a good reason to lay out a blanket, slather on the sun block and settle in for the duration. Nestled among the trees, these newly constructed fully equipped and beautifully appointed cottages offer a warm and inviting home away from home. The resort includes one, +loft, 2 bdrm and +loft units as well as an onsite Boutique, Sushi Café, Day Spa Salon, pool, hot tub and fitness room. Next door get ready to challenge your opponent to a Mini Golf match at Riptide Lagoon. Complimentary Mini Golf passes will be supplied upon check-in. Kids absolutely love this! Parksville Community Venture & Waterpark guarantee to entertain children for hours. The kids will enjoy the swings, zip line, tire swings, obstacle course, slides and awesome waterpark. Bring a picnic lunch or eat at the on site concession. The Parksville Community Park is located on Corfield Road in scenic Parksville Bay. Producing award winning artisan cheeses the old fashioned way. Free tours – open to the public. 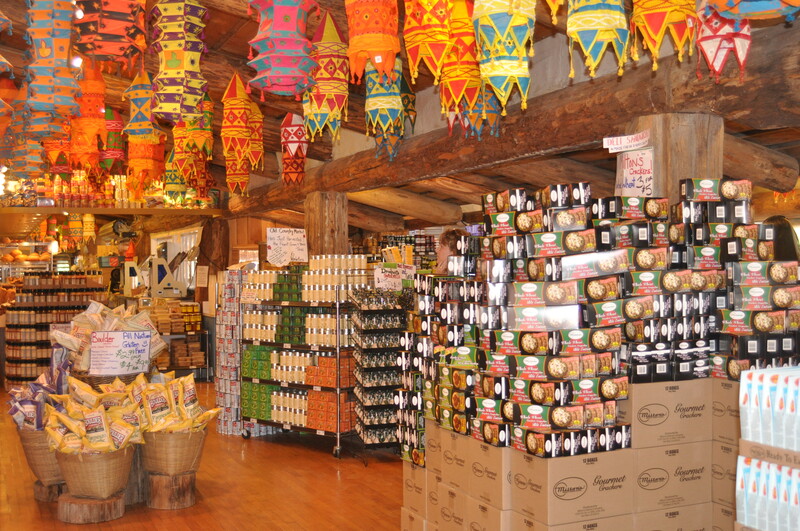 Great samples in the farm gate store. A number of great activities and educational programs for the whole family to enjoy. View: eagles, bears, owls, turkey vultures, falcons, hawks and much more. This is a temporary recovery facility to assist and aid animals so they can once again be a part of their natural environment. Many attractions, activities, galleries, and spectacular Provincial Parks to discover. In particular, Englishman River Provincial Park and Little Qualicum River Provincial Park. Both are located off Hwy 19 and offer pristine hikes, swimming, site seeing, and photographic opportunities. A great place to experience farm living. They cater to all ages of animal lovers. Learn to milk a goat, feed the sheep, pet the burrow, hold the chickens, or go out on a trail ride on horseback. Two mini-golf courses, video arcade, redemption games room, and ice cream parlour. Paradise has something for everyone – including an oceanfront RV Park, gift shop and is wheelchair accessible. 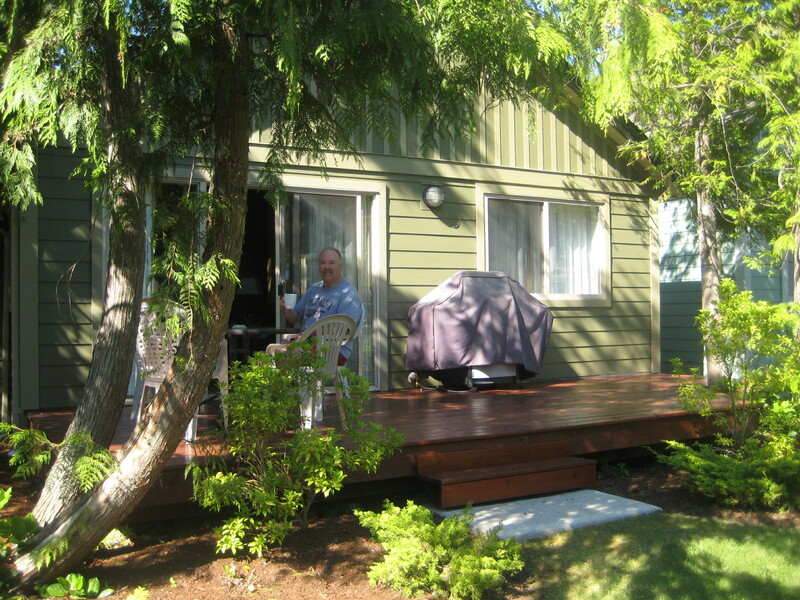 An easy walk from Rathtrevor Beach and nearby resorts. Young and old alike can enjoy themselves for a fun and challenging game on this18 hole course. Home of Mount Washington Alpine Resort, a world class training facility for 2010 Olympic winter competitors, from more than 10 countries. Nestled between the Beaufort Mountains and the Strait of Georgia on the eastern coast of Vancouver Island, the Comox Valley is a collection of rolling mountains, delicate alpine meadows, rushing rivers, pristine lakes, lush forests, fertile farms, incredible beaches and more than 40 green parks. Four major museums, live theatre, a dynamic music scene, an active artist community and year round cultural festivals and events are just a few of the many attractions the Comox Valley has to offer. Gourmet cuisine, unique shopping experiences, galleries and eclectic coffee and tea shops line the streets of the Comox Valley’s urban centers. Or head into the quiet farmland, hills and coastlines of the Comox Valley and experience the relaxed atmosphere of rural life. Courtenay is the urban centre and cultural hub of the Comox Valley and is a great base for a holiday. Fifth Street is the heart of downtown, and tempts shoppers with a delightful array of shops and galleries. Your adventure begins in the Courtenay and District Museum and Palaeontology Center. Here, a friendly and informative guide will give a brief lecture and show a short video about the famous discoveries made in the local area. Then, it’s off into the exhibit galleries to see the actual specimen and reconstructed cast of an Elasmosaur found in the Puntledge river. You’ll also see other vertebrate fossils, such as mosasaurs, turtles, and fish -along with the invertebrate fossils of shelled creatures that lived in the warm, shallow ocean surrounding Vancouver Island 80 million years ago. A short 10 minute drive and an easy 5 minute forested walk brings you to one of the many beautiful fossil sites along the Puntledge river. Here, you’ll experience the thrill of hands-on discovery. After a brief discussion about the history of the site and proper collection techniques, participants will have a chance to find a fossil of their very own. A limited number of hammers, chisels and goggles will be supplied. You can keep any fossils that you find on the tour. If the species is of scientific value, you may be asked to donate the fossil to the museum collection, with the finder’s name attached. You will require your own transportation to the fossil site. Turn right onto Cliffe Ave. Turn Left at Anderton Ave.
At the 4 way stop, Turn Left onto Piercy Rd. Enjoy the scenic ride on the Eagle chairlift to the summit of Mount Washington (1588 m elevation) and take in the spectacular surroundings. The panoramic view from the top includes Strathcona Provincial Park, the Comox Glacier, Mt. Arrowsmith, the Strait of Georgia and even Mt. Baker on a clear day. Once at the summit, interpretive signs identify the unique flora and fauna found in our mile high alpine as well as the more distinct landmarks you are able to view along the self guided tour on the easy bark mulch trails. You then have the opportunity to take the breathtaking chairlift ride back down or choose to hike a more rugged downhill trail to the base. Follow the signs to Saratoga Beach (there are numerous Resorts along the waterfront and parking will be indicated along the road) Miracle Beach is the large BC Provincial Campground. At the north end of the Comox Valley, at the mouth of the Oyster River, Saratoga Beach may be the ultimate stretch of shimmering sand on the sheltered east coast of Vancouver Island. The tide along this stretch of the shoreline goes out for over a quarter of a mile, creating a hard-packed oceanfront playground perfect for children. The gently sloping beach continues for well over a mile into the calm waters of the Strait of Georgia, creating warm, shallow and safe swimming conditions, free from powerboat traffic, deep water or strong currents. Saratoga Beach is flanked by popular camping and recreational sites at Miracle Beach Provincial Park and Oyster River Regional Park. For 14 years, Atlas Café has been the home of long lunches, lingering dinners and perfectly overstuffed breakfasts in the Comox Valley. It’s where friends share laughs and colleagues share ideas, and the entire community gathers to share our passion for great food. Features traditional Thai cuisine at an affordable price. It is conveniently located at the corner of 8th St and Fitzgerald Ave in Courtenay (526A Cumberland Road). It is a comfortable place for you and your family to dine in or to take out. 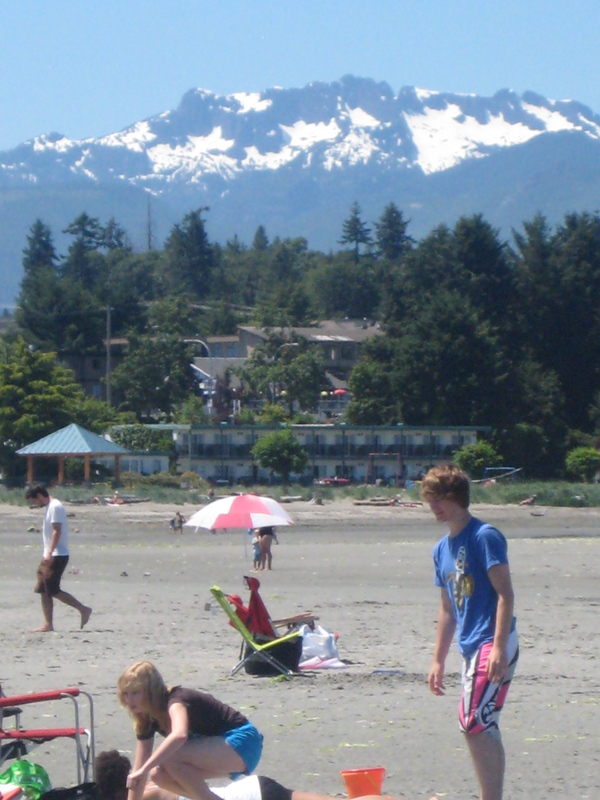 Another Beach area you may want to explore before you leave the area is in Comox. At low tide the sandy beach is incredible and expansive. This beach is a very popular spot for locals especially due to its close proximity to downtown Comox. Fire pits are provided for those wanting to cook of just hang out by the fire. There is ample parking but it does fill up fast, so be sure to come early. To find the park, head south of Comox on Comox Road, then turn left on Pritchard Road and right on Balmoral to Lazo Road, beyond which Balmoral becomes Hawkins Road and leads out to the spit. Note: the drive from Port Alberni to Tofino is very scenic but the road twists and turns and goes up and down around the mountains. If anyone is prone to motion sickness, they may want to sit up front and look at the road. 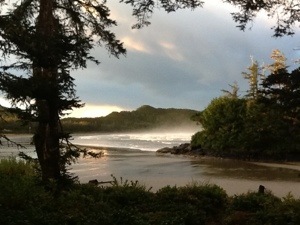 Tofino (population about 2,000), reigns as jewel of Canada’s west coast. The stunning beauty and ecological diversity of Tofino’s location in the Clayoquot Sound UNESCO Biosphere Reserve is the source of all activities. Imagine, all in one place, fishing, kayaking, whale-watching, bear-watching, bird-watching, camping, hiking, storm-watching and First Nations cultural touring. Surfing is big here, and Tofino was named the best surf town in North America in Outside Magazine’s 2010 Editors’ Choice awards. An outstanding view of Browning Passage and Meares Island greet the diner – a setting framed by wall to wall windows. Sunsets are a romantic’s delight and the ever changing waterscape will make it difficult to concentrate on choosing your menu selections. The Blue Heron’s menu features fresh Dungeness crab to salmon to tender Grade A steaks. Welcome to Shelter Restaurant. Our unique restaurant in Tofino offers the basics – food, wine, shelter – at their best. Shelter combines a sophisticated seasonal menu with a relaxed attitude and panoramic view. At Shelter restaurant we try to use local and organic ingredients whenever possible. Everything is fresh! The salmon, halibut, and the prawns are caught locally and the shellfish is from Outlandish Seafood suppliers in the Gulf Islands. The chicken is from Lyle Young in the Cowichan Valley. Our greens are grown a few kilometres from the restaurant at Douglas Brooker’s farm in Barkley Sound. Enjoy your experience. If you like fish and burgers, this is the place to go. Fresh cut fries, tempura batter and tartar sauce, halibut, cod, salmon, prawns, oysters, crab cakes, popcorn shrimp, grilled salmon and halibut, coconut prawns, homemade beef burgers, chicken, fish stew, clam chowder, appys, wraps, caesar salad, $9.00 & $10.00 specials (Monday to Thursday). Browning Pass Charter cruises are designed for comfort and leisure with an emphasis on wildlife viewing. On the Bear tour it’s not unusual to see bears feeding on the shoreline, eagles on their nests, seals, harbour porpoises, blue herons, and much more. This vessel has a heated cabin, washroom facilities, galley, and large upper viewing deck. Historical interpretation of the area is given by the skipper, Michael White, lifetime resident of Tofino. SoBo Restaurant, SoBo means Sophisticated Bohemain. A combination of boldly imaginative, world wise dishes expertly prepared with simple, fresh, locally produced- often wild- ingredients and served in an environment that is somehow both elegant and rustic. Sophisticated Bohemian not only represents the style of culinary integrity and relaxed ambiance that Artie and Lisa Ahier have cultivated- it also reflects the personality of Tofino itself. After Port Alberni along Hwy 4, Remember to stop at Cathedral Grove. Victoria is a unique blend of old world charm and new world experiences. Heritage architecture, colourful gardens and traditions such as afternoon tea mix with soft adventure such as kayaking, fishing, hiking, cycling and golf; culinary experiences such as gourmet farm and wine tours, microbreweries and world class dining; and arts and culture. As an island destination, Victoria offers visitors an escape from the hurried world and beams with ambience. Victoria also boasts the mildest climate in Canada and is green year-round. This combined with the wild beauty of the Pacific Ocean and old-growth rainforests set against a backdrop of the Olympic Mountains makes for a favourable lifestyle and a desirable destination to both live and visit. Rising regally on Victoria’s spectacular Inner Harbour, The Fairmont Empress showcases the spirit and energy of Vancouver Island in grand style. With her turn-of-the-century beauty, The Fairmont Empress captures the grandeur and elegance of a bygone era, while her facilities and services meet the needs of today’s traveller. Bring the entire family to Victoria to experience a variety of attractions. Your package includes: two nights accommodation in a Fairmont room, full breakfast for the entire family, children’s activity book, including local kid-friendly attractions and choice of milk and cookies or pop and popcorn upon arrival. Fort Street has long been know as Antique Row for its many auction houses and antique shops, but the arrival of several new fashion boutiques gives North Fort a fresh feel. Studio Ryu specializes in East meets West clothing lines – such as Vivienne Tam, TSE and Thakoon – Asian origin with a relaxed West Coast feel. Next door is Not Just Pretty whose keen eye for modern yet sustainable clothing lines embodies Vancouver Island’s green lifestyle. The most difficult part of guilt free shopping here is choosing just one dress to bring home. To complete any new outfit, head over to Heart & Sole, for both funky and functional footwear options or peruse the antique shops for that perfect piece of vintage jewellery. The area is situated in the heart of Old Town and is characterized by colourful heritage buildings, but the shopping experiences are fresh and hip. The neighbourhood defines the new buzz word “HeritEdge.” Storefronts primarily feature locally designed fashions, but naturally-made products, cosmetics, hair salons, coffee houses and restaurants complete the mix. Shoppers will not want to miss Smoking Lily, Graciela’s, Gloss Beauty Bar and North of Wednesday to name just a few. Nearly all 37 businesses are locally owned and many by first time proprietors. Victoria’s Chinatown is small, but the oldest in Canada. Once home to opium dens and gambling halls, Chinatown now mixes contemporary stores and live-work condos with traditional Asian markets and diners. Many of Victoria’s contemporary home decor and furnishings stores are found in this neighbourhood. Visitors can stroll historical Fan Tan Alley – the narrowest street in Canada – or the newly developed Dragon Alley. Beacon Hill Park is Victoria’s beloved park in the heart of the city and is celebrating its 125th anniversary in 2007. Victoria is well known as the City of Gardens due to its mild climate and Beacon Hill Park is a great example. The interior of the park has a Victorian landscape of manicured flowerbeds, graceful trees and lakes and bridged streams. Located in Beacon Hill Park is the world’s tallest, free-standing totem pole carved from a single log, a cricket pitch and a children’s petting zoo. *Note: Below Beacon Hill Park lies Dallas Road and Clover Point. This is a favourite area for locals. Kids can scramble along the rock beach and drift wood while the locals walk, run, kitesurf, windsurf, hang glide and fly kites above. This tiny park, located behind the Royal British Columbia Museum, is home to several totem poles and a First Nations carving shed. In the summer, Native carvers showcase their traditional skills to create new totems. The Noodle Box made its debut as a street food vendor in 2001, serving South-East Asian noodles in the classic, white Chinese-style boxes, enticing locals with fresh ingredients and delicious smells. A local favourite and an easy place to eat when you are on your own. Red Fish Blue Fish is a canteen-style, take-out fish restaurant operated out of a steel shipping container on Victoria’s Inner Harbour. The shipping container’s reuse is part of a trend called “upcycling” which aims to reuse material without using energy to break down its components in the recycling process. This seafood taqueria serves 100% Ocean Wise sanctioned local fish including Pacific halibut, wild salmon, albacore tuna, Qualicum scallops and Fanny Bay oysters. Open for lunch and dinner. A really cool place to eat really cool burgers, The Pink Bicycle serves homemade original recipe burgers using quality meats, cheeses, and produce that are sourced as close to home as possible. Quite possibly the best burger in town! Fresh baked goods and fresh coffee served in a casual environment in one of Victoria’s heritage buildings. Also features a full breakfast menu. Willie’s opens at 7:30 am. Born of a longtime friendship, and a desire to serve excellent food to friends, foodies, hipsters, families, retirees and everyone in between, Mo:Le restaurant has grown from a simple eatery into an institution in just a few years. Sourced from local and organic farms, Mo:Le serves creative and lovingly prepared food, made for all tastes and eating philosophies (vegans and raw foodies included). Funky offering of delicious healthy food to eat in or take out. All day breakfast and lunch. Spend the day at your leisure. For the visitor who is young, or young at heart, Victoria and Vancouver Island have plenty of fun things to see and do. From attractions and museums to zoos and recreation, there is something for kids of all ages. By nature, Victoria and Vancouver Island have miles and miles of things for families to do. Ocean waters, long sandy beaches, rainforests and wide open spaces wait to be explored. 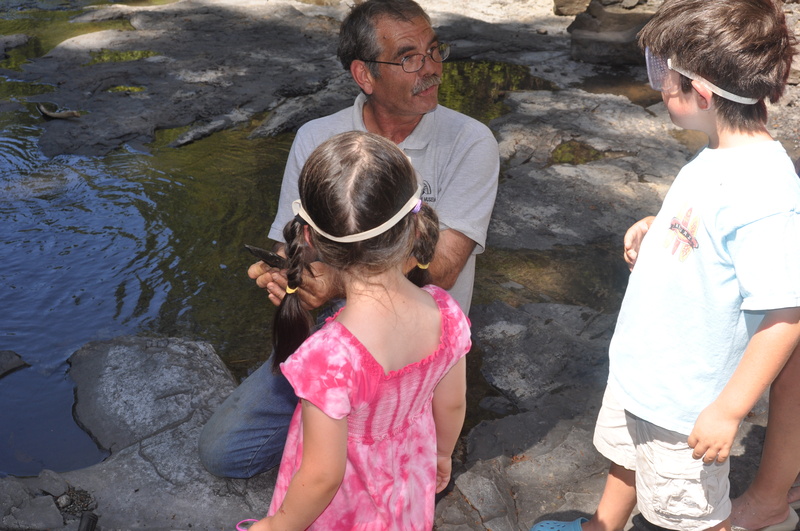 Children are encouraged to get up close and personal with local marine life, bugs, butterflies and farm animals at Victoria’s unique gardens and zoos. Museums abound on the Island and have hands-on displays and activities for their favourite little customers. 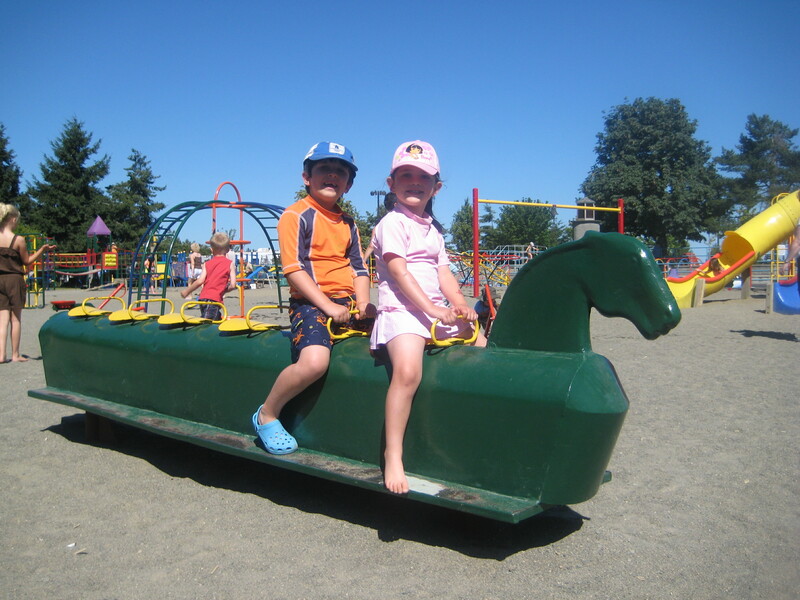 Recreation centres, swimming pools, waterslides and mini-golf are always popular with the whole family and many of Victoria and Vancouver Islands festivals cater to children. Fisherman’s Wharf is home to several houseboats, the fresh catch of the day sold daily and some of the best fish and chips in Victoria at Barb’s Place. Ice cream too! A scenic walkway starting at the end of Belleville Street near the Laurel Point Inn follows the Inner Harbour to Fisherman’s Wharf. If you are lucky, resident wild seals may make an appearance. Feeding fish (bought from the local vendors) to the seals is a favourite with kids! Victoria Harbour Ferry Company Ltd.
Victoria Harbour is world renowned for its bustling traffic and unique waterways. Victoria Harbour Ferry tours are equally renowned for their friendly skippers and fun, informative tours. 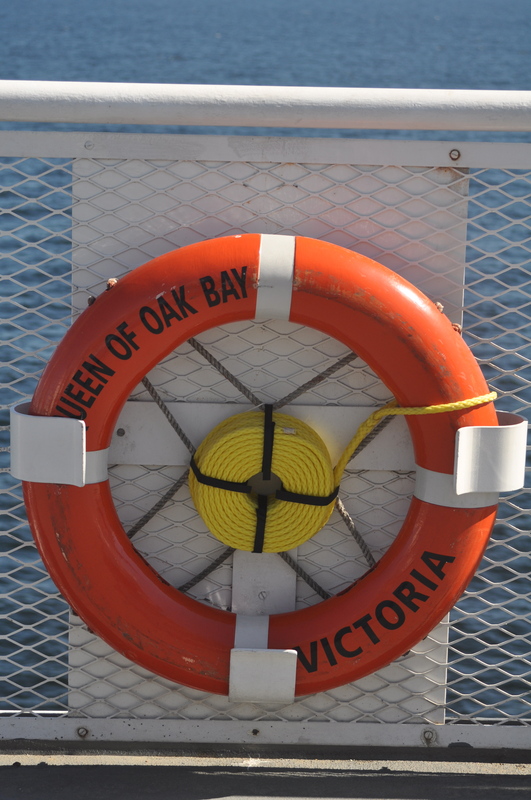 Hop aboard one of our little ferries and see Victoria from the water. Look for our “FERRY STOP” signs at major waterfront locations around the harbour. Welcome to the amazing world of insects and spiders. A visit to this attraction offers visitors an excellent opportunity to view and experience multi-legged creatures from around the world in a safe, fun and friendly atmosphere. Get up close and personal with LIVE giant walkingsticks, alien-eyed praying mantids, hairy tarantulas and glow-in-the-dark scorpions, to name a few. Discover over 40 fascinating species including Canada’s largest ant farm. The knowledgeable “bug guides” will reveal the exotic secrets of this hidden kingdom and provide a safe animal handling experience for the more adventurous. Imagine holding a tickling 400 leg millipede that stretches the length of your forearm! Bring your camera. It’s an unforgettable, hands-on adventure. When the British immigrated to Victoria, they brought the practice of afternoon tea with them and it has been an honoured tradition in Victoria ever since. The Fairmont Empress Hotel is the iconic destination to experience afternoon tea. The Fairmont Empress welcomes its young guests with a special “Prince and Princess” Tea for children. Children receive beverage of their choice, fresh fruit and whip cream, jello and their own tiered plate of sandwiches and sweets. The experience is completed with the presentation of a Prince or Princess certificate in the child’s name. 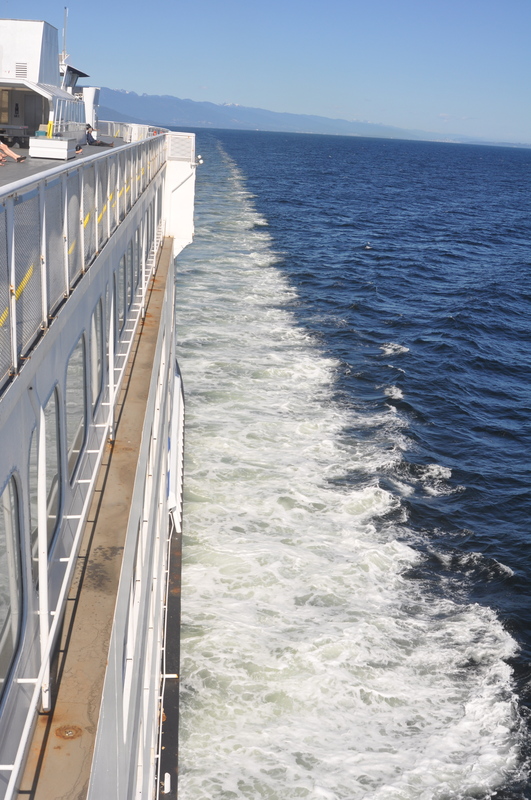 Our journey began with a striking BC Ferries ride aboard the Queen of Oak Bay, from Vancouver’s Horseshoe Bay to Nanaimo, BC. Equipped with an indoor playground, television and onboard WiFi, there was plenty to keep the kids occupied for the two-hour journey. But it was the sight of the sun sparkles dancing on the ocean that stopped them in their lively tracks—Mt Baker and the gulf islands looming silently in the background. Tip: In summer, secure a ferry reservation. Rathtrevor, Qualicum Beach, Qualicum Bay and Parksville, all of them framed by snow-capped mountains. 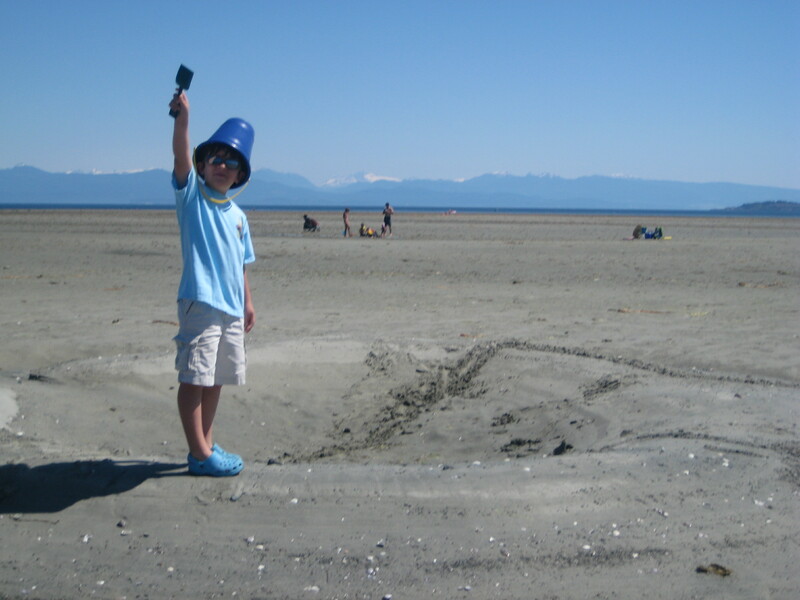 Parksville Beach wins the prize for owning the best playground my well-travelled family has ever encountered. Parksville’s beachside Ventureland (waterpark included) has every fun slide, swing and monkey bar imaginable. Plus, when the tide is out, the Parksville Beach next door extends outward at least a kilometre, leaving tide pools full of mini crabs and sand dollars. Kid heaven. Tip: Rent a family-perfect cabin at Oceanside Village Resort, a brief and well-cedared walk to the mountain-ringed Rathtrevor Beach. Coombs, BC's Goats on the Roof is possibly Canada's best General Store.